On Friday 29th September, over 40 people from across Greater Manchester travelled to Preston New Road in Lancashire to show solidarity with the local community who have been campaigning tirelessly to protect their community from the dangers of fracking. 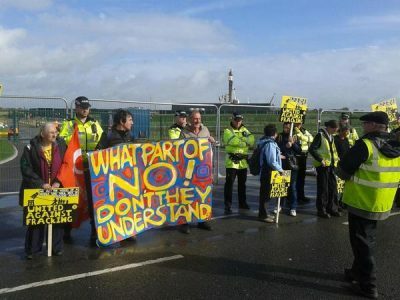 We were joined there by a wide range of other people, from Tina Rothery and other members of the local community to a group of campaigners who had defeated the fracking industry in Northern Ireland – and together we stopped any vehicle movements on or off the fracking site that day. Keep an eye out for future solidarity trips on Facebook, or join our mailing list.